OSWEGO — The Oswego County Historical Society will host the 27th Annual “Not So Silent Auction” fundraiser on April 25 from 6 to 8:30 p.m. at the American Foundry at 246 W. Seneca St., Oswego. Tickets are $20 and will be available for purchase at the door the day of the event. 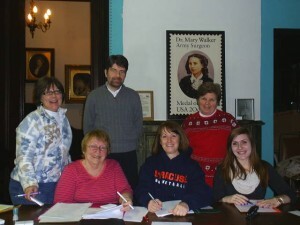 Pictured are auction committee members involved in the planning of the 2014 event. Seated from left to right: Lyn Patterson, Dawn Holynski and Beth Krise. Standing are: Fran Lanigan, committee co-chair; Justin White and Mary Shanley. Anyone wishing to make donations of quality items for the auction may call the museum at 343-1342. The society maintains and operates the Richardson-Bates House Museum, a historic landmark listed on the National Register of Historic Places, located at 135 E. Third St., Oswego. All proceeds from the auction event benefit the society’s programs and the ongoing maintenance of the museum. The museum is open April through December on Thursday, Friday and Saturday from 1 – 5 p.m. and other days by appointment. For more information visit the museum website at www.rbhousemuseum.org for regular updates.